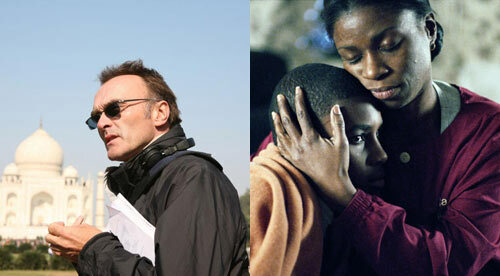 Left: Danny Boyle in India. Right: JimMyron Ross and Tarra Riggs in Ballast. On this edition of the Plastic Podcast, Robert Davis first talks with Danny Boyle about his new film, Slumdog Millionaire. Among other things, they chat about what drew him to the project, his impression of India, working with his co-director Loveleen Tandan, his strategy for editing multiple timelines, and the film's surprising depiction of torture — over a game show. Then Rob talks with Lance Hammer whose debut film, Ballast, is moving gradually around the country. They talk about the music he almost added, the eye of an art director, the impact of Godard and the Dardenne brothers on the film, the way he gleaned dialogue from his extensive, "architectural" process of rehearsal and improvisation, and the tone of the Mississippi delta. We talked about Slumdog Millionare on our Toronto podcast, and J. Robert Parks reviewed it in his Toronto diary. We talked about Ballast on our Sundance podcast, and Rob reviewed it here. In the interview, Danny Boyle refers to the book Maximum City. And Rob referred to the audio books When You Are Engulfed in Flames by David Sedaris and The Wordy Shipmates by Sarah Vowell. Someone said something about A Silver Mt. Zion. Excerpts from the interview with Lance Hammer appear at pastemagazine.com. Darren Aronofsky's new film is called The Wrestler, and much of it is shot with a handheld camera that sometimes -- only a few times, really -- stares at the back of its eponymous hero's head as he walks around. It brings to mind Jean-Pierre and Luc Dardenne whose films -- only a few of them, really -- sometimes make use of this same composition. It's exciting to think that mainstream American filmmakers may be influenced by the Dardennes, but the link to The Wrestler is fairly superficial. That isn't to say it's a bad film, not at all, but Aronofsky's appropriations, if they be, are skin deep. If he'd used a Steadicam for that same shot, we'd all be citing Béla Tarr. The linkage goes much deeper in Ballast, the tiny, Mississippi-based debut by writer-director Lance Hammer who not only alludes directly to the Dardennes with a shot of a guy on a motorcycle but also seems to have internalized the humanism that drives their style. Rather than use the camera to gawk at an unfamiliar world, Ballast feels like an attempt to live within that world for as long as possible. The Dardennes are known for using minimal exposition, natural light, only diegetic music -- a quilt of countervailing minima, you could say -- and they've proven that such a spare style lends weight to even minor flourishes. A film's entire attitude may rest on the timing of a cut to black. There's a scene in Ballast that shows the young protagonist sketching the face of a playing card, a king, while his mom discusses his schooling with his uncle. The discussion is happening in the wake of a family tragedy that has left everything in question, including the boy's future. While he and his pen remain in focus, the grownups are a blur in the background, squished by the lens so they look like aliens. Aside from its inherent beauty, the shot seems open to the mind in a way that it might not be if it were just one of many such gestures. But it's unique in the film, and it seems to have leapt from the work of the Dardennes -- who, to my recollection, haven't shot anything that looks quite like this -- toward something that is similarly inspired but also quite new. In this scene, the boy's attention remains fixed on his pen-project while Hammer's remains fixed on his camera-project, which is the boy, the lives of rural Mississippians, the world he seeks to know however an outsider with a camera can. The voices of the adults are soft in the mix. Hammer's final shot before the Son-like cut to black is a pan inside a moving car that sets the characters on a particular trajectory. This simple, quick camera movement connects the same three people we saw in the sketching scene and elegantly answers a central question, answers it in the affirmative, and answers it silently. There's great pleasure in watching characters solve their problems by standing on them like ballast, and there's great pleasure in discovering a new filmmaker who's more interested in watching the rise than the fall. Hear also: my chat with Hammer at Sundance '08.